The VC-25 is powered by four General Electric CF6-80C2B1 turbofan engines, each delivering 56,700 pounds of thrust. Because the aircraft, due to its configuration, carries only a light payload, it has a greater range than a normal B747-200 and is able to fly at higher speeds. The VC-25 aircraft are flown by the Presidential Airlift Group and assigned to Air Mobility Command's 89th Airlift Wing at Joint Base Andrews in Maryland. Air Force One often operates in conjunction with Marine One helicopters that transport the President to and from airports in situations when this option is prefered over a vehicle motorcade. The VC-25 has served as the main aerial transport platform for Presidents George H.W. Bush, Bill Clinton, George W. Bush, and Barack Obama. Principal differences between the VC-25 and the standard Boeing 747-200B, other than the number of passengers and crew, are the cutting-edge navigation, electronic and communications equipment (incl. multi-frequency radios for air-to-air, air-to-ground and satellite communications), the interior configuration and furnishings, self-contained baggage loader, front and aft air-stairs, and the capability for in-flight refueling. The aircraft communications bay is located next to the cockpit on the second floor of the aircraft. For self-defense, the VC-25 is equipped with advanced electronic countermeasures and anti-missile flares. Accommodations for the President include an executive suite, located at the very front of the aircraft beneath the cockpit, consisting of a stateroom with dressing room, lavatory and shower. The President also has a spacious personal office onboard. A conference/dining room is available for the President, his family and staff, while other separate accommodations are provided for guests, senior staff, Secret Service, Air Force security personnel, and news media. The VC-25 has a compartment outfitted with medical equipment and supplies for minor medical emergencies. Also, six passenger lavatories, including disabled access facilities, are provided as well as a rest area and mini-galley for the aircrew. The aircraft's two galleys can provide up to 100 meals at a time. The decision to procure the VC-25 was made during the Presidency of Ronald Reagan. The first VC-25A, tail number 28000, flew as Air Force One for the first time on September 6, 1990 and transported President George H.W. Bush. A second VC-25A, tail number 29000, transported Presidents Clinton, Carter and Bush to Israel to attend the funeral of Prime Minister Yitzhak Rabin in 1995. The VC-25 was used intesively on September 11, 2001. President George W. Bush spent much of the day in the air because Air Force One was considered the safest place to be at the time. Air Force One carried the President to and between a number of air bases before, later in the day, heading back to Washington, D.C. According to the latest long-term U.S. Department of Defense (DoD) aviation funding plans, the Air Force will recapitalize the VC-25 fleet. 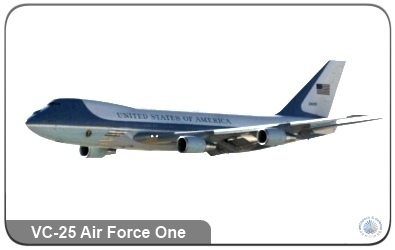 On January 28, 2015, the Air Force announced that it will award the contract to build the next Air Force One to Boeing. The contract was not competed because Boeing's 747-8 is the only aircraft made in the U.S. that, when fully missionized, meets the necessary capabilities established to execute the presidential support mission. A 15-year Presidential Aircraft Replacement (PAR) production forecast is available through Forecast International's Platinum Forecast System, which includes a breakout of total market unit and value statistics by manufacturer and end-user. This real-time service also includes information on all prime and subcontractors, contract awards, worldwide inventories, a complete program history, and a rationale detailing the outlook of the program. 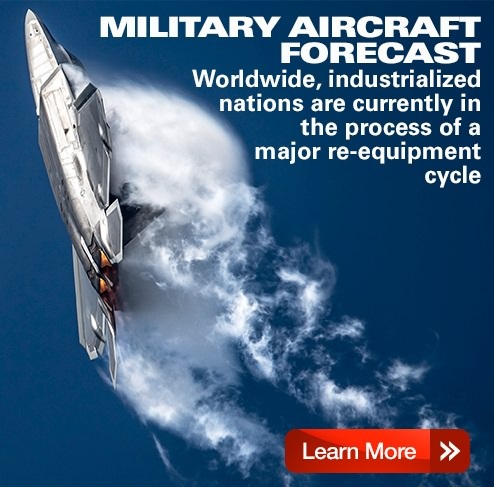 A 10-year PAR production forecast is also available in report format through Forecast International's Military Aircraft Forecast service. This data is available in Forecast International's U.S. Defense Budget Forecast, a comprehensive analytical database containing historical and forecast budget figures, year-to-year funding comparisons, congressional budget markups, program justification documents, and much more. Source: U.S. Department of Defense (DoD) and The Boeing Company. Complete and detailed information, including production forecast data, is provided in our Market Intelligence Service: Military Aircraft Forecast. With Forecast International's U.S. Defense Budget Forecast, you not only get the latest program news, the DoD funding, worldwide inventories and planned quantities, long range forecasts, but most important – an expert's rationale for all programs and the overall market. The Platinum Forecast System® is a breakthrough in forecasting technology that enables you to select your own unique criteria to create distinct market segments. With Platinum, you can create customized assessments that quickly identify both risk and future opportunities. System types and platforms, currencies, world regions and more can all be input to collect the intelligence that you need, when you need it. Seize competitive advantage and discover what Platinum, the premier aerospace, defense, power systems and electronics market forecasting tool, can do for you. Click here for more information and a FREE demo.